In addition to my work as a journalist, I’m also a fiction writer and self-published author. I wrote and self-published a funny little book called Walking With Walser. I’m so proud of this little gem. It’s a modern retelling of a story written more than a century ago by one of my favourite authors of all time, Robert Walser. It tells a semi-autobiographical tale of a writer who goes for an all-day walk in her neighbourhood, Queen West in Toronto. But can it help a person learn to skate? And can it win a political campaign? Ursula, an eccentric, middle-aged writer, likes to walk almost as much as she likes to write. One day in the spring of 2013, possibly to avoid the digital network where she makes her living but also just because it’s a beautiful day, Ursula puts her hat on her head and sets out along her favourite thoroughfare, Queen St. West, in Toronto. Walking, thinking, watching and talking, Ursula opens to her neighbourhood. She visits a bookstore, goes to the bank, has lunch with a friend, attends a dress fitting, posts a scathing letter to the mayor, and considers having her hair cut. She chants om. She picks flowers. Walking is Ursula’s way of greeting Mother Nature. This is her way of honouring her favourite writer of all time, the flâneur Robert Walser. This is bliss. But every sunny day must come to an end, and every walk must turn homeward again. As a soft rain begins to fall, Ursula is overcome with grief, loss, and regret. Will she find relief from her pain? Will she run for mayor? Will she learn to skate? Most importantly, will Ursula finally learn to believe in love? The effect of this little book is staggering: like its narrator, it is bold, outrageous, opinionated, and deeply compassionate. I want to carry it everywhere I go, the way Gordon did with the translation of Walser’s original. It is a talisman, a palimpsest, a strange and beautiful gift. Using gleeful satirical set pieces, Gordon raises thought-provoking questions about car culture, digital slavery, bad government, mental health, sustainability, and art. 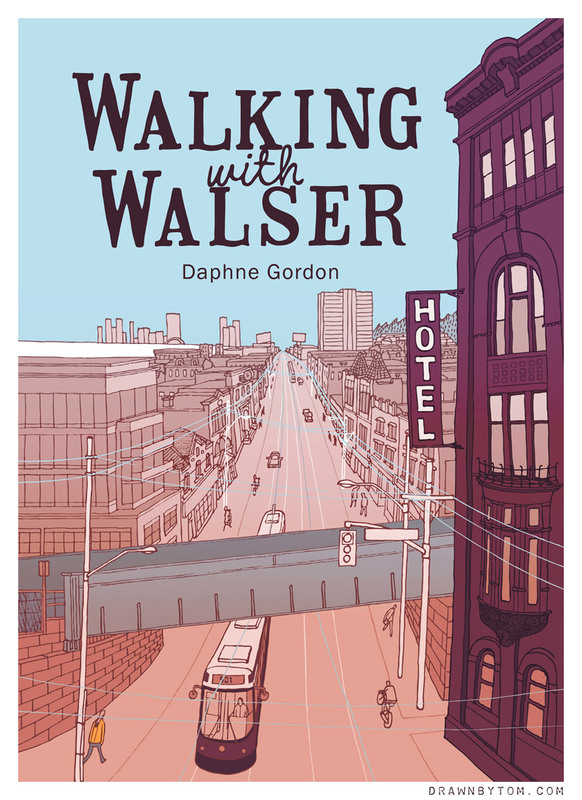 Walking with Walser, entertaining as well as profound, should be essential reading for New Urbanists and Jane Jacobs fans, city cats and country mice, past and present devotees of Queen Street, dedicated pedestrians everywhere, and anyone with a sturdy sense of humour. Press the little arrow buttons below to move through a 20-page excerpt. I’m a fiction writer and self-publisher. I love to walk almost as much as I love to write, and the two things came together in 2013, when I spent a lot of time walking in my downtown neighborhood — Queen West, Toronto. My son was four years old and was (finally!?) in school during the day. I was exploring my neighbourhood anew, experiencing myself and the world again after what felt like a four-year maternity nap. I wrote this book while sitting in the city’s cafes, parks, and public spaces. It’s my way of meditating on motherhood, community and creativity. It’s me saying thanks to the place where I live and the people who live near me. It’s an act of love. Walking With Walser is available as an ebook or in print at major online bookstores. I loved this little book. Daphne completely captures the spirit of Toronto’s Queen Street West! The central character, Ursula, is outspoken, hilarious and heartwarming. Through her eyes we get an interesting view of some of our society’s pressing issues. Art and culture, traffic and transit, mental health and local government. All in a humorous way. Having walked the same route many times, I found it particularly enjoyable. It’s an easy but engaging read, and an inspiration to enjoy an urban stroll. Highly recommend. A fun quick read. Daphne really captured the spirit of the Queen West neighbourhood and the local characters. The story really gives you the experience of slowing down for a while and getting the perspective of the world on foot and makes you want to get outside and explore your own neighborhood this way too. This book is a breath of fresh air. I enjoyed reading it a lot, a lot! Flâneur is something I’ve never read.